﻿ June 2017 Marketing and Holiday Planning » Red Mango Marketing! It’s hard to believe that we’re almost halfway through 2017! June is the perfect time of year to review your first few months of business and see where you need to make adjustments in the second half of the year. If you aren’t hitting your numbers the way you’d like, try one of the ideas below to increase revenue for your business. 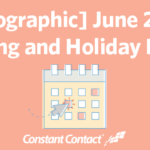 June is also full of holidays your business can take part in, like Father’s Day, Summer Solstice, and Social Media Day. You can send a timely email to your audience in a matter of minutes, using Constant Contact’s professionally designed email templates. Your business can also push sales by holding a special Summer Solstice event and extending your store hours. Or, celebrate Social Media Day on June 30th by encouraging your customers to post a photo of themselves at your business. Offer a prize to the person who gets the most engagement on their photo — and you’ll benefit from some increased exposure to a relevant audience. Looking for more content ideas? There’s plenty more ideas to choose from in the infographic below. Take a look or download and print the inforgraphic to stay on track all month long. Put these ideas into action. The post June 2017 Marketing and Holiday Planning appeared first on Constant Contact Blogs. This entry was posted on Friday, May 19th, 2017 at 11:00 am	and is filed under Choosing Templates, content, content ideas, Email Marketing, News & Updates. You can follow any responses to this entry through the RSS 2.0 feed. Both comments and pings are currently closed.